The quaint village of St Lucia, is home to an estimated population of 500 residents. However during peak season this number skyrockets to almost 5000 visitors. It's a remarkable village, one which remains virtually green year round due to the subtropical weather. Not only can one expect to enjoy pristine beaches, warm weather but rather its the wildlife that attracts just so many visitors year after year. When one refers to Wildlife one would imagine it's the odd antelope and the larger animals that one could easily witness when venturing into the iSimangaliso Wetland Park that borders St Lucia. However this is not the case at all, yes one can see wildlife and a huge variety of wildlife in the Park but no it's the Hippos that make St Lucia especially special. Hippos roam the village, Yes they roam the streets mostly in the residential area however numerous sightings do take place in the main street of St Lucia (McKenzie Street). Should you be walking to any of the numerous Restaurants in Town at night please do take note that Hippos are most likely to be seen. Should you come across these magnificent animals please keep your distance. Cross to the opposite side of the road and Do Not Approach Them. We have compiled some interesting Hippo Facts and Information make's for a great read. It is estimated that 800 Hippos can be found in the St Lucia Estuary one of Africa's largest and highest density of Hippos. The animals all venture out in search of grazing and are therefore nocturnal. Yes Nile Crocodiles, approximately 1200 of them can be found in and around the Estuary. One can witness these animals mostly on the banks of the Estuary basking in the sun. Crocodiles are opportunistic and remain incredible cunning. Do Not Swim in the Estuary. Yes believe it or not Sharks are also in the Estuary, please note that the estuary closed naturally in the early 2000's. Sharks trapped in the system have remained and quickly adapted to the environment. Varying degrees of brak water remain in the estuary making survival for certain shark species possible. These no swimming signs can be seen in numerous areas especially along the banks of the Estuary, please do not take these signs lightly. Certain beaches do also have these signs and are due to strong currents. 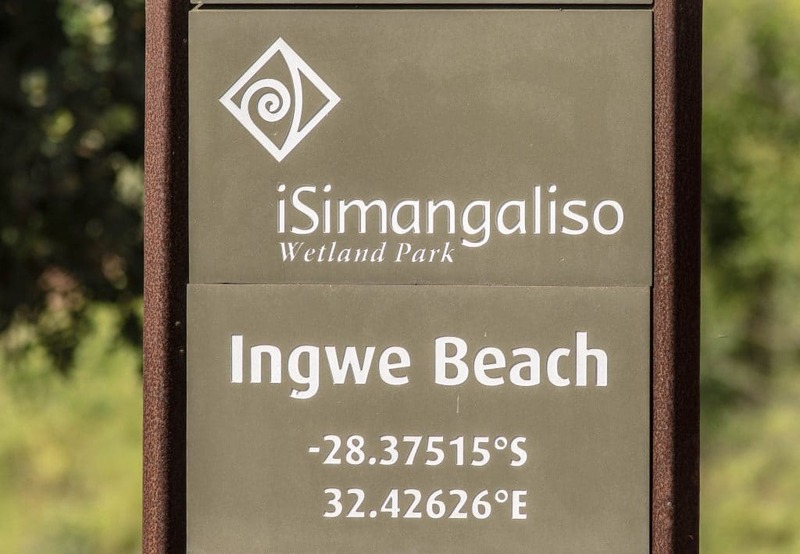 All iSimangaliso Wetland Park signage indicates the wildlife species that may be found in that particular area as well as precautions that must be taken. The above signage indicates Leopard, Hippo, Elephant, Buffalo and Rhino. iSimangaliso Wetland Park Main Beach signage. 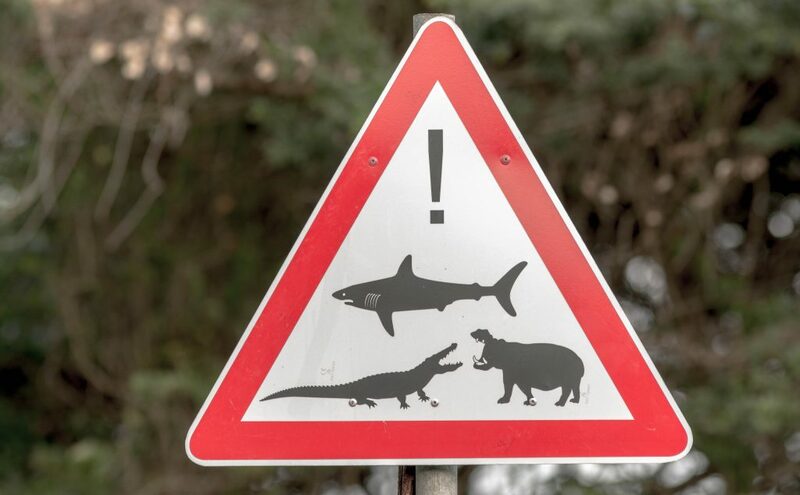 Sharks, Crocodile and Hippos are sometimes witnessed even on the beaches, obviously not Sharks. One might ask why Crocodiles, as discussed earlier Crocodiles are opportunistic and they will venture anywhere they think a easy treat might be found. This is more likely after the Umfolozi River has flooded. The main beach offers ample parking and ablution block with showers. The boardwalk is a superb way of witnessing the estuary and beach with all of its splendor. The boardwalk is situated close to the St Lucia Ski Boat Club. Their is ample parking with incredible views of the Estuary. This area is busy with wildlife from bird life to Hippos and Crocodiles lying on the banks. St Lucia is the ideal getaway, not only can one relax but one can enjoy the immense wildlife just on ones doorstep.